Moteng and RaxUSA offers outdoors and sports related products. They have categories such as Sports Apparel, Beach products, Body Boards, Skareboards, Gifts, Helmets, Lighters, Surf and Swim products, Sport watches, Outdoors, Camping, Tools & Knives and Kitchen cutlery. You can get your own website loaded with products from Moteng and RaxUSA. Signup for a free trial to review all our prodcuts first and if you like the prodcuts and prices, then activate a dropship plan and start reselling these great products. Moteng and RaxUSA will take care of shipping orders for you and wholesale2b will create and maintain your website for you. We can also help you with the order processing. All you need is a Paypal account to link it very easily to your website admin backend. 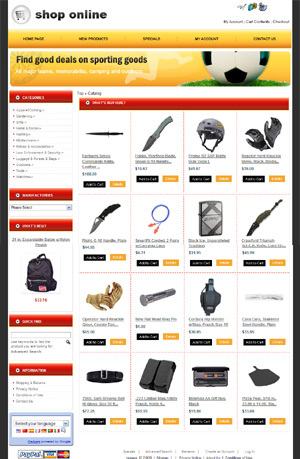 We will build a fully functional sports & outdoords website for you loaded with all the products from Moteng and we will apply daily updates to your website by adding the latest products provided by moteng.com. Instead of doing it yourself, save time and thousands of dollars by letting us build a website loaded with products from Moteng and RaxUsa for you. Drop shipping can be complex at times as it requires many business and techincal components to fit very well together. With wholesale2b, we do all the hard work for you, so you can get started without having to hire a developer, a webmaster, or finding suppliers and getting approved.